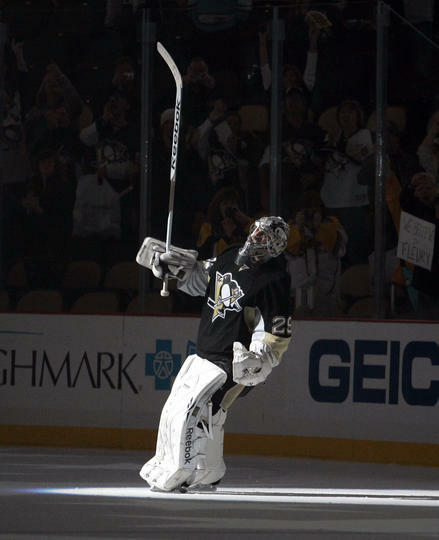 Fleury, Pens bounce back strong. The Pens picked up a huge confidence building win Friday night with a 5-1 win over the Tampa Bay Lightning. This confidence was very important to everyone on the team, but even more so to Marc-Andre Fleury. Fleury made some huge saves throughout the entire game and especially down the stretch to preserve the win for the Pens. He did not face an incredibly large number of shots, but the ones that did make their way to him were high quality chances. Fleury stopped all but one rocket shot from Stamkos midway through the 3rd, and became the 7th youngest goaltender all-time to reach 150 wins. It took a little while for the Pens offense to get going, but they were quite effective once they did. After a scoreless 1st, the Pens hit the Bolts with the same quick back to back strike that devestated them Wednesday against Boston. Pascal Dupuis got the 1st with a nice tip-in from a Letang wrister and Alex Goligoski scored again less than half minute later. The Bolts D recovered and even pulled within 1 with a Stamkos howitzer but the Pens would open it up again later in the 3rd. Max Talbot gave the Pens that important put-away goal with a wrister on a 2 on 1 break. A few minutes later, Sidney Crosby added to his point total when he pushed one past Smith after a nice neutral zone takeaway by Pascal Dupuis. 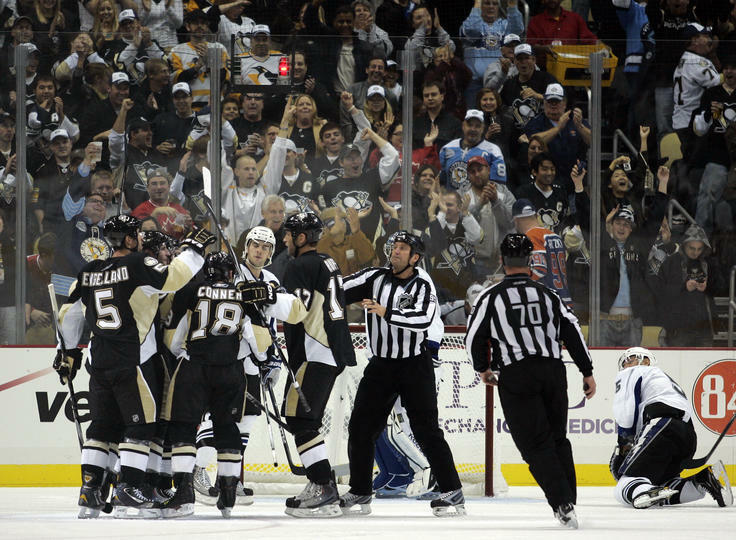 Deryk Engelland gave the Pens fans one last treat when he scored his 1st NHL goal in the closing minutes of the game. It's nice to see Eggo rewarded for all his hard work over the last few games. Talbots goal put the game on ice and stifled any chance of a Tampa comeback. Offense: A- Best showing I've seen from the Pens offense in weeks. Well done. Defense: A- Held Tampa and their dynamic duo to just 16 shots. Fleury: A- Cant blame him for the one goal he let in because Stamkos may have broken the sound barrier. Great performance, and huge confidence builder. Powerplay: C Not the greatest showing. Penalty Kill: B Let one in, but they had quite a few penalties to kill. -Chris Conner looked good last night. If he has another solid showing or 2 I wouldn't be surprised to see him stay in Pittsburgh, considering Comrie's season-long struggles. -Crosby/Kunitz/Dupuis line finally starting to gel. -Am I ready to say that Fleury is back to his old form after just 1 start? Not quite. But I will say that he is on his way.